Johanna has practiced and taught bodywork for over 20 years, blending Esalen ®Massage, Deep Bodywork®, Somatic Integration®, creative movement and her own practice of presence into a unique style of bodywork. She is a German born clinical psychologist and a teacher of the Diamond Approach® in the Ridhwan School, teaching bodywork and Yoga workshops (E-RYT 500) and certification trainings at the Esalen Institute in CA as well as internationally. As a staff member of the Esalen Massage crew and the movement program she has created and taught the Esalen In-house Yoga teacher trainings. Johanna’s intention is to touch the totality of the soul through loving present touch, allowing the receiver to come home to the immediacy and dynamic stillness of their Being. 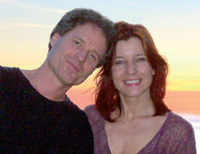 Perry has been a bodywork teacher for over 25 years, teaching in the USA, Europe and Asia. He is based at the Esalen Institute in Big Sur, California, where he has developed the Deep Bodywork Program along with his wife, Johanna. He is the creator of the European Esalen Massage Teacher’s Training, and is a coach and consultant for individuals, businesses and communities using the Gestalt Organizational Consulting Approach.